Home / Moving To Australia / Which City Is The Best To Live In Australia? 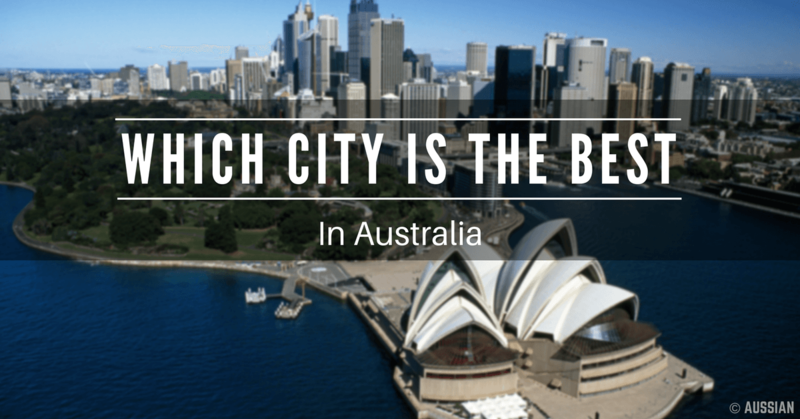 Which City Is The Best To Live In Australia? Did you get your Australian PR? Fantastic! Welcome to the club. 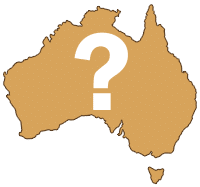 Next question in your mind must be – where should I live in Australia? Of course, if you have a state or region sponsored visa, this problem is already solved as you have to stay within that state or region for the next two years. But for people with 189 subclass visa, making that choice is not easy. At least it wasn’t for me. I didn’t even know whether Sydney was on the east coast or the west coast. All my knowledge about Australian cities was from cricket. Apart from Sydney and Melbourne, they were just names to me and some still are, though I have a much better geographical sense of Australia now. Jokes apart, but finalising a city looks like a trivial task but it’s not. 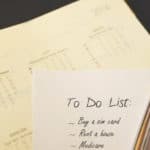 There are a lot of parameters involved, especially if you are moving with family. So how should you choose? No worries. Based on my experience, here are the seven most important parameters which you can use to choose the city for living. First and foremost task when you move to any country is making money. 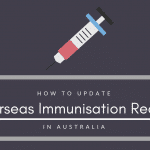 Most of the people who migrate to Australia come without any job offer in hand. Goes without saying, the city that offers more employment opportunities wins here. But there is a problem. More employment opportunities will attract other people too. So you have to face stiff competition, meaning fewer job opportunities for you. So you have to find the right balance and a bit of luck too. Remember, no matter what city you choose, you are still up for quite a lot of struggle to crack the first job. Now let’s take a look at the boring part – statistics. 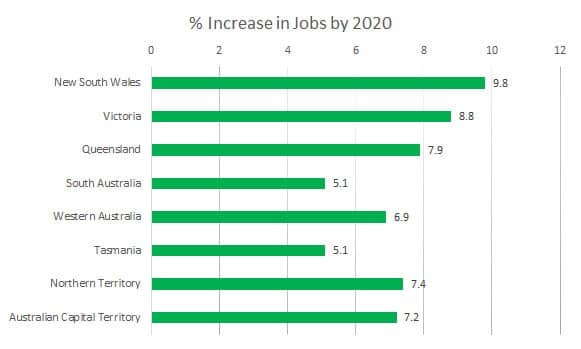 According to the Australian Department of Employment, states of New South Wales, Victoria and Queensland contribute 77% of the jobs in Australia. Of the top three states, NSW contributes the most as evident from the chart above. It is followed by Victoria and Queensland. Department of Employment also predicts future growth in the number of jobs by state. Unsurprisingly, once again NSW tops the chart, followed by Victoria and Queensland. Most of the jobs are concentrated in the major cities in each of the state. For example, Sydney accounts for more than 66% of the jobs in NSW. Similarly, Melbourne contributes to 77% of the jobs in Victoria. 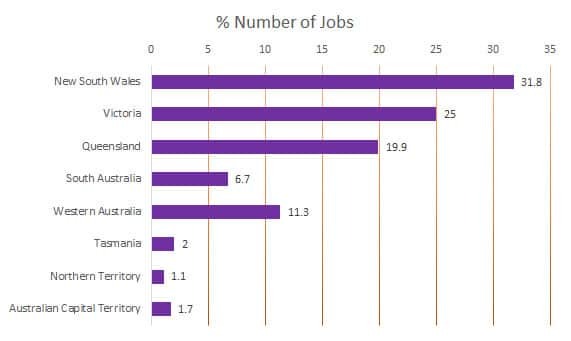 In Queensland, Brisbane gets the credit for 50% of the jobs and similar is the case with Adelaide and Perth. If you look at the charts above and employment data for the cities, Sydney emerges as a clear winner followed by Melbourne, Brisbane and others. But remember what I said earlier: more jobs, more competition. So don’t base your choice purely on the number of jobs. Australia is an expensive place to live. Unless you are a millionaire ready to spend a fortune, you need to give some thought here. Sydney is generally considered the most expensive city to live in Australia but others are not too far behind. Most commonly, two things make up for nearly 80% of family’s living expenses – rent and child care – both of which vary depending on the city. 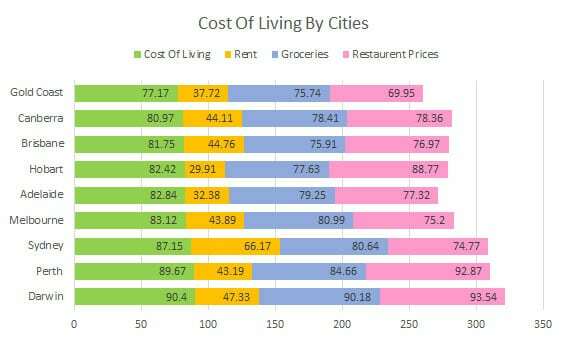 In order to find out which city suits you better in terms of cost of living, you can visit Numbeo to make the comparison. It gives you a detailed comparison of two cities based on various factors such as rent, eating out, groceries, transportation, child care, utilities and so on. Let’s again plot the data to compare different cities. Results are a bit surprising. Sydney is not the most expensive in terms of cost of living as you would have expected. Darwin followed by Perth takes the lead here. However, Sydney is costliest in terms of Rental prices as expected. Hobart is the cheapest city in terms of Rentals where Gold Coast looks to be the cheapest city of all. A note here: statistics on Numbeo is based on people’s feedback. Though it uses sophisticated technology to remove borderline cases and provide a better estimate, ultimately it is user input. So it should be taken with a pinch of salt as different people have different lifestyle and habits. Based on your lifestyle, you may find one city better over the other. Moving to a new country is a tough job. You are going to face a lot of difficulties, especially in the initial period. It helps a lot if you already have relatives or friends living there. If you have a family with young children, it can be life-saving to have some support. If you need a temporary place to stay, need help to move from one place to another or need help to babysit your child or feel homesick, they are the ones you can rely on. They will be the only people who will make you feel at home. 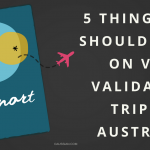 They can quickly get you on board about how to live in Australia. This is another crucial factor to look at after employment and cost of living. Nothing else matters if you have the right people to help you when needed. As an example, when I first moved to Melbourne, I had an ex-colleague and friend who helped me with the initial accommodation. He helped me get myki pass for public transport, bought me a SIM card and helped me choose the plan. He helped me move my stuff and even gave me some of his own stuff when I rented a place. 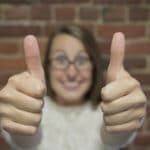 These are the small things which can make a big difference when you are new to everything. Australia is huge, I mean really massive. When you arrive as a new migrant, you don’t have the luxury of riding a car. 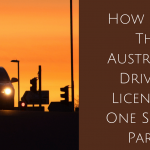 Even if you can afford it, you still need time to get the full Australian driver’s license. One way or the other, you will have to rely on public transport for the initial few months. In terms of public transport coverage, Victoria in general and specifically Melbourne has an extensive public transport system. It has the largest tram network in the world, the rail network which is the second largest in Australia and a pretty good bus network. Also, Melbourne’s Central Business District (CBD) area is a free tram zone which means you can ride trams for free within the city. Of course, this doesn’t mean that other cities are bad in terms of public transport. Sydney, for example, has the biggest usage of public transport in Australian capital cities. Almost all the major cities has rail, bus and other forms of transportation. So unless you are moving to the Outback, you have a lot of options. Now let’s look at the cost factor. Once again I turned to my trusted source – Numbeo for the data. As can be seen, one way ticket and taxi fare are fairly the same in all the cities. Monthly pass however has a lot of variation across the cities. 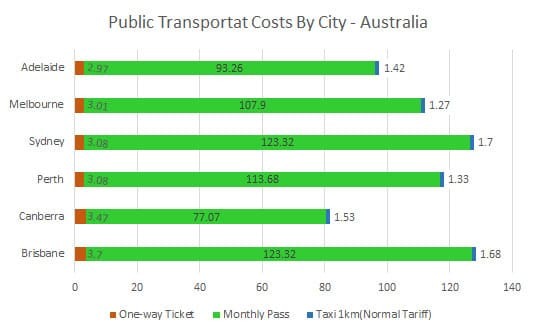 Sydney and Brisbane ranks equally high for monthly pass however Brisbane is slightly more expensive in terms of overall transportation cost. Canberra however is the cheapest of all followed by Adelaide and Melbourne. This should give you some clarity on which city is better in terms of public transport. When you say Australia and safety, the first thing that pops up in our mind is racism. Well, like most of the things portrayed by media, it is not true except for a few random cases. I won’t say that Australia is a paradise with no crime but it is not a hateland either. With it’s strict gun-control laws and strong law enforcement, Australia is safer than the US. 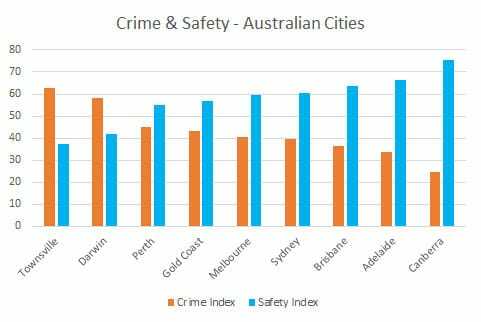 Once again Numbeo gives us a good idea to compare crime rates by various Australian cities. According to the current safety index by Numbeo, Canberra proves to be the safest city with a score of 75.59 and Townsville to be the worst at 37.39. The two big cities Sydney and Melbourne are nearly the same, however, Melbourne’s reputation slowly going south due to frequent gang-related violence lately. Are you a beach lover? Do you love sunny weather with occasional showers? Do you love chilly winters (seriously?) Well, there is a place for everyone in Australia. Melbourne with its infamous erratic weather can give you taste of all seasons in a day. Otherwise, it’s mostly quite chilly and windy, a bit like Chicago. Sydney on the other hand is moderate and humid and most of the time quite pleasant, though it has it’s own share of heat waves as well as thunderstorms. Brisbane has comparatively the best weather of all the cities, with winters not too cold and summers not too hot. However, during the winter time, massive thunderstorms and flooding occur in Brisbane. Perth is hot and dry and most of the time gets a lot of sunshine, sometimes a little too much. Similar to Brisbane, winters there are not too cold and the temperature rarely goes below zero degrees. In short, Australia has a wide variety of climate and choice is yours. This is not really a prime factor in choosing a city, however an important one. For example, a sports-loving person will probably get bored to live in Canberra. At the same time, peace loving person may find Sydney too crowded and fast. Similarly, if you love nightlife, Adelaide won’t be high on your list. If I compare cities in Australia to cities in India, Sydney would be like Mumbai – busy and chaotic financial hub but iconic and full of energy. Melbourne would be like Bangalore – a lot of gardens and greenery, lots of sports, festivals and cultural events, a bit slow compared to Sydney but still with it’s own character. Brisbane is probably like Pondicherry – great weather, nice beaches and a peaceful life. Gold coast is like Goa – highly popular with tourists, a lot of sunshine, full of tourist attractions and great beaches. Perth is more like Chennai – hot (but not humid) weather, nice beaches but far away from other cities. Adelaide is like Pune – sleepy and small town, nice weather, quiet and a little bit boring. Canberra obviously is like Delhi, full of government offices, memorials, politicians and a lot of public servants. As I said earlier, it is a matter of preference. If you are can’t decide between two cities even after all the other parameter, you can use this as a tiebreaker. So the question still remains – which city is the best to live in Australia? The answer is whichever you like the most. As each individual has different tastes and preferences, what I think is the best city will not be the same for you. However, I hope that this post gives you some foundation using which you can finalise your choice. If not, probably toss the coin. Just kidding! What are the other things you would look at when choosing a city? Let me know in the comments. 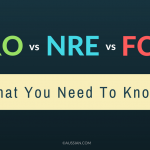 NRO vs NRE vs FCNR – What You Need To Know? Nice to learnt lot from you about Australia. Any chance to relocate. In fact in search of job and a change in life with a good person like you.details I can send if you have options to help me out. Thanks mate! Your chance to relocate to Australia depends upon your skills assessment, but it’s definitely worth every ounce of efforts. I would be happy to help you about any specific query you have. Woww.. Its very much helpful for me. I already applied for PR(From India, Mumbai) . And your blog help me a lot. Can i mail you if i need any further help from you? Surely you can mail me on harsh @ aussian.com if you need any help. By the way, thanks for visiting the blog and letting me know that you like it! Thnx for the article… Its helps me a lot as i already applied for my PR. Extremely well written. I like the comparison of cities with Indian cities most, as it will give a clear picture to us, Indians. Thanks for all the write-ups. Thanks Sourav, that was intentional. I knew I had hard time choosing city when I emigrated. I wanted to make it easy for others to make that decision. I am glad you found it useful. Thanks for your response. Cheers, mate! I have applied for my Visa and hopefully will be getting by July / August. 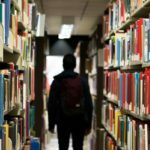 I want to get some idea from your regarding job search techniques. I have also sent you a LinkedIn connection request. Please accept it. Thanks in advance. Very informative and well written. Thanks for sharing your experience. We have our PRs and will be relocating to Melbourne at the end of the year. Thanks Mrs Subbaiah for taking time to comment that you liked the article. It really encourages me as a writer. 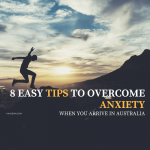 I assure you that you will get tonnes of information on moving to Australia here and hopefully, it will help make your move much easier and simpler. Cheers! I met my friend Milind Lokde, fortunately he happened to be your friend and told me about your site. It was worth reading your experience and guide. My Appreciation & Thanks to you on behalf of all your friends in India for your taking time to write. I am sure it has helped many. Here is something I would need to know, how reliable are people are doing with in Australia, as I have distributors appointed in 3 states for equine business and looking forward to move and open a business entity there. Our business will be more to warehousing the goods and shipping from there as it’s all online. Just to save cost on shipping. Welcome to Aussian and thanks for your kind feedback! I am grateful to Milind for spreading word about my site. As for your question, I believe you are asking how reliable are the people here to do business with. As far as I know, people here are very professional and respect their job. Not just high skilled professionals like doctors or engineers but any kind of worker – may it be cleaners, painters , tradesman etc. Having said that, there are a few bad apples everywhere. But in my two years of experience, I have yet to meet one. So, in my opinion there is nothing to worry for you. Hope I understood your question correct.